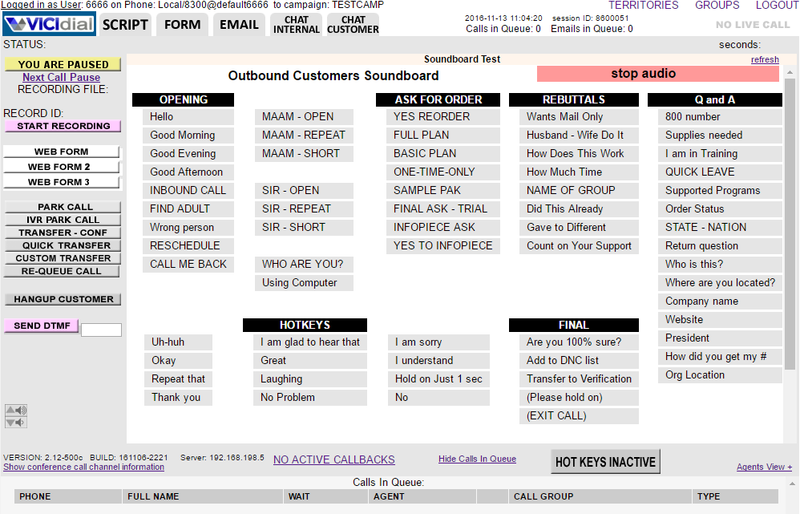 The Vicidial open source call center platform in its latest release (Version: 2.12-11 Build: 161111-1646) has included a feature long awaited by off shore outsourced call centers: An Avatar Soundboard. For those not familiar with Avatar call center software, the concept is simple. Essentially, instead of a live operator speaking directly to a customer on the phone, instead the operator will play pre-recorded sound files back to the customer on the phone. This is useful in many cases, including agents that may understand english speakers, but have thick accents that are difficult to understand by customers over the phone. Additionally, by using Avatar agents, recorded responses are universal in voice and tone and thus can be planned in advance. Often, Avatar campaigns are used as “opener” campaigns to dial through bulk leads to qualify them, before transferring them to closers. Vicidial’s Avatar Soundboard (shown below) can be configured with pre-recorded responses, organized on a single page that allows the agent to simply click on the appropriate response to play the associated sound back to a customer.